Rheology is the study of the viscoelastic properties of liquid and soft matter. 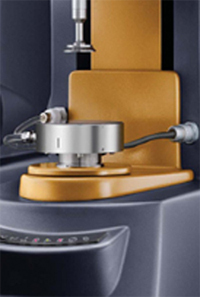 Graduate students have access to a TA Instruments, HR-2 Discovery Hybrid Rheometer. This instrument is the industry standard for the mechanical analysis of gels, liquids crystals, structured fluids, and other soft materials. The instrument is equipped with a magnetic thrust bearing, an dual optical strain recorder, a Peltier plate, and radial air bearings. It is capable of applying torques down to 2 nN-m and measuring displacement down to 10 nanoradians.